Myer has received a second “strike” on pay at the retailer’s highly anticipated shareholder meeting with a 37.5 per cent protest vote based on proxy votes received before the meeting. Myer chairman Garry Hounsell used the meeting in Melbourne on Friday to hit back at billionaire Solomon Lew, claiming it has been a “very vindictive campaign” which was terribly destabilising for our staff”, “our landlords continually get rattled, our bankers” and described the campaign as a “travesty”. He rejected Mr Lew’s claims the campaign only hurt the board but was destabilising the company. Myer’s chairman Garry Hounsell has cut his fees by 25 per cent. “What he wants to do is get control of this company … without paying a proper premium and if he succeeds it will be a very sad day for all shareholders,” Mr Hounsell told the AGM. Mr Hounsell claimed new CEO John King’s strategy may hurt sales in the short-term but will ultimately deliver more profits and defended their decision to no longer release quarterly sales figures. Myer has come under increased pressure after poor quarterly sales results which were leaked to The Australian Financial Review and forced the company into a trading halt, giving Mr Lew ammunition to overthrow the “clueless board”. But the chairman defended the result, and said it had narrowed the loss that it usually records in the first quarter of the financial year. The company is pursuing a strategy of not chasing unprofitable sales. “Total sales value in Q1 FY19 was below Q1 FY18, however, importantly the NPAT loss (pre-implementation costs and individually significant items) for the quarter showed an improvement on Q1 FY18,” said Mr Hounsell. The most fiery moment on Friday’s meeting came when Mr Lew’s lawyer Jeremy Leibler asked whether the chairman would rule out the prospect of another profit downgrade. He also grilled Mr Hounsell over failing to disclose the quarterly sales figures which fell 4.8 per cent and triggered a 17 per cent fall in the share price. “Did the Myer board seriously think the decline in sales wouldn’t affect the share price?” Mr Leibler asked. “You must think I’m silly,” Mr Hounsell said. “I’ve already answered the question, we are aware of our continuous disclosure obligations,” he said. Veteran British retailer John King said he has been touring the country visiting stores and warned the retailer has “disconnected from their customer”. “I’ve seen funeral homes lit more brightly…. we don’t look like we are open”, he said of one store he visited in Wagga Wagga. Myer chairman Mr Hounsell said his own fees had reduced by 25 per cent, as had the fees paid to his board colleagues. The chairman said they had also cut costs including a shake-up of the executive team and measures such as withdrawing from the Melbourne Cup birdcage. “I assure you, we understand the challenges, we have a clear plan to address them and we now have the right leadership to build a better business that delivers for all shareholders,” Mr Hounsell told the AGM. Mr Hounsell defended the failure of the retailer to release poor quarterly sales figures which he claimed were “unlawfully” leaked to the Financial Review. “On 16 May 2018, Myer advised the market that with effect from the commencement of FY19, it would not report quarterly sales. The market therefore had no expectation that Myer would report sales for the first quarter 2019. Importantly, some 70 per cent of similar retailers don’t report quarterly sales,” he said. 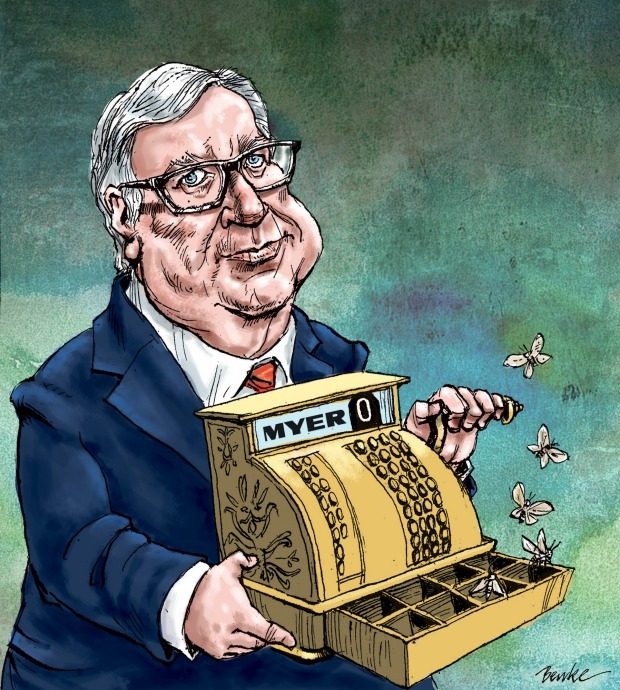 “The market in which the Myer shares have been trading has been particularly disrupted during the past two weeks as a consequence of activities by parties other than Myer, its board or management. Specifically as a result of letters from Premier Investments,” he said. Mr Hounsell also defended the appointment of director Ms Cattermole and called for the re-election of director Dave Whittle who have both been criticised for a lack of retail experience and insufficient ‘skin in the game’ meaning too few Myer shares themselves. “Lyndsey brings to the board significant IT skills and knowledge, which is relevant to many areas of our business including point of sale, website, supply chain and logistics, and IT improvements to our back of house,” he said.